Few visitors to Bali venture beyond the usual spots like Kuta, Seminyak, and Ubud. But up above the highland mist, Bedugul teems with wild wonders. Bedugul’s mountainous terrain in the heart of Bali offers everything an outdoor adventurer will love. Yet, while most of the things to do in Bedugul involve rainforests, lakes, and waterfalls, there’s also a Balinese culture and lifestyle that’s somewhat safely removed from what you’d experience in tourist territory. I’ve been to Bedugul twice, the second time in January 2018: the depths of low season after the eruption of Mount Agung. After a fabulous day in the mountains, my wise and witty guide Pak Yuda turned serious for a moment. “It has been raining in Bali nonstop for the past three days; you can see the water marks on the walls of houses that were flooded. Yet today has been dry all day. It feels like a miracle. 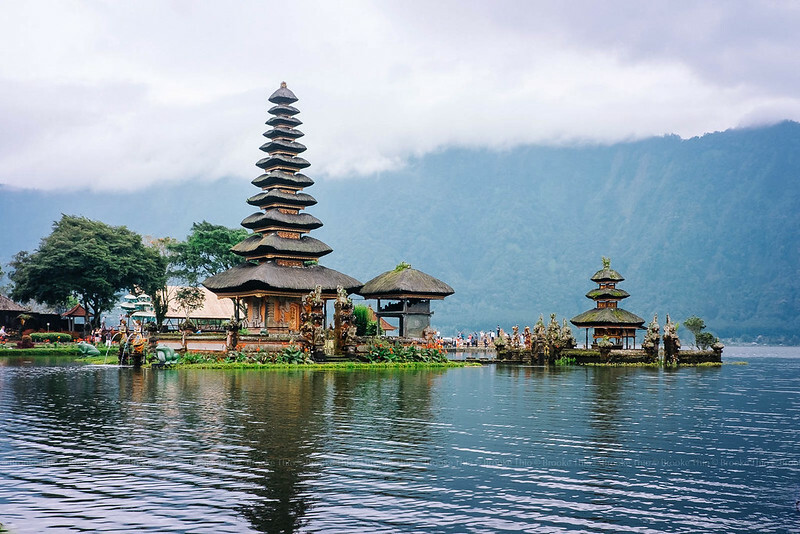 Ulun Danu Bratan temple (pura is the Balinese term for a temple complex) is located on the banks of Lake Bratan, and is one of the key water temples in Bali’s complex irrigation system. It’s also one of the more iconic landmarks of the island. This is a great first stop in Bedugul, as all you have to do is immerse yourself in the beauty of the temple complex – there’s little walking and no climbing involved. Entry fees: IDR 50,000/adult; IDR 25,000/child; IDR 2,000-10,000 for parking. covers Pura Ulun Danu Bratan, Jatiluwih rice terraces, and Tanah Lot. This is a great place to try salak gula pasir, a special cultivar of salak (also known as snake fruit) that, unlike elsewhere in Indonesia, is exceptionally small, crunchy, and sweet. If you’ve visited the Tegalalang rice terraces in Ubud, close your eyes for a moment and recall what it looked like. Now, take that mental image and multiply it tenfold. Unlike Tegalalang, the rice terraces around Bedugul are not within a valley. They cascade down the mountains, endless green waves that undulate far into the horizon, while clouds stage shadow play. Here, the significance of the ancient subak system becomes clear, and you’ll feel like the only tourist for miles around. While the Jatiluwih rice terraces are the most famous, you can enjoy a similarly dramatic experience at nearby Babahan and Pacung rice terraces. In places where the rich volcanic earth of Mount Lesung hasn’t been plowed, the rainforest proliferates. When I brought my mom to Bedugul, I’d wanted her to experience something really unique – so I booked a horseback trekking tour for us with Munduk Wilderness. Trodding along on the soggy ground in start-stop rain, the guides led my mom and I through the Munduk rainforest. The birds had fallen silent and as thunder broke through the green canopy my horse, Bibsi, got increasingly spooked. Thankfully, we reached the banks of Lake Tamblingan just as it started to pour and we squeezed our way into a tiny smoked-up hut, waiting with the locals for the storm to pass. Lake Bratan, Lake Buyan, and Lake Tamblingan are all found on here at Mount Lesung (#4, Lake Batur, is on Mount Batur). Lake Bratan is right in town at Bedugul, and is home to one of Bali’s key water temples: Pura Ulun Danu Bratan. The local who took us out on her boat. Lake Buyan isn’t particularly attractive, but Lake Tamblingan’s dramatic landscape makes it a great spot to camp (there are designated campsites). You can also rent a traditional dugout double canoe and row out onto the mirror-still waters to watch fishermen and birds. With its seven cascades and lush jungle setting, Sekumpul waterfall is one of the most majestic falls in Bali. It’s best visited in a private trekking tour like this one as it can be difficult to get there yourself. However, do note that most tours to Sekumpul waterfall include a stop for kopi luwak (civet coffee) which I personally do not recommend due to animal welfare concerns. Saranam Resort & Spa ($$): One of the few upscale hotels in Bedugul, with an enviable view of rice terraces spilling down the hills. is one of the most affordable ones you can pre-book. N.B. A surcharge of IDR250,000 applies if you visit Lake Tamblingan, which falls under Buleleng Regency, outside the service area. If you are going on a tour in Bedugul, your tour operator should be able to include two-way transfers. The best time to visit Bedugul (and Bali in general) is from April to September, with the rainy season spanning October to March.